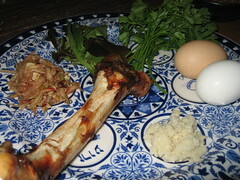 And that has led me to conclude: a barbecue plate fills in nicely for the Passover seder plate. Once you get past that kosher thing, that is. What the barbecue plate lacks in tradition(! ), it more than makes up for in taste. And it’s not hopeless on the symbolism front, either. First off–the barbecue (or pork, for you heathens). You can’t tell me that some finely chopped N.C. barbecue doesn’t look a little like haroset, the apple-walnut-wine concoction meant to symbolize the mortar used to build the pyramids. Barbecue can play that role. 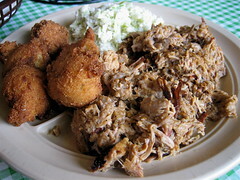 I’m willing to accept either slaw or fried okra as the karpas, symbolizing springtime and renewal. Best of all, you won’t have to dip the okra into salt water (representing the tears of our ancestral slaves in Egypt) because it’ll already be salty as heck. Meanwhile, collards can serve as the bitter herbs. Although they’ll probably have been boiled with enough pork to eliminate all bitterness and kosherness. Hush puppies don’t really work with the whole not using flour modus operandi, unfortunately. While matzah meal hush puppies would be wrong on many levels, they might be worth asking for just to enjoy the blank stares. For beverages, a glass of Cheerwine would substitute nicely for that tired old Manischewitz wine. And don’t forget to enjoy 4 cups, as we’re commanded! On a final note: Good luck finding anything resembling a shank bone (in place of the lamb shank), or any kind of bone, for that matter, at a N.C. barbecue joint.